Sometimes in your daily work routine you might need some extra features from the Microsoft Office Suite. One way to get extra functionality is through Office Add-Ins. Sometimes these are bundled with Office but not included with the initial installation. These are easily accessed and installed. Here I will show how to install an add-in with Excel. Open Excel and click on the Office Button and go to Excel Options and then Add-ins. In the View and Manage Office Add-ins window, near the bottom. make sure “Excel Add-ins” is selected in the drop down box and click Go. 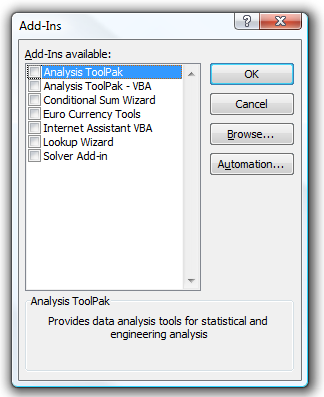 This will open up the Add-Ins window where you can select an appropriate package for your Excel tasks. If you highlight each Add-In you’re provided a quick description of what each one is. You will get a progress message while the add-in is installing. After the add-in is installed it will be available in the Ribbon. In this case the Euro Currency Tool was place under the Formulas tab other add-ins may vary. Other times you can install an add-in from downloading an executable from the Microsoft Office site. 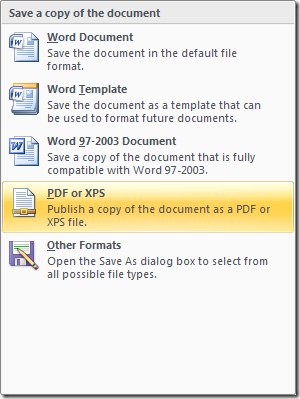 For Instance previously I wrote about the Save to PDF add-in for Word 2007. Another one I featured was adding a Creative Commons license to documents. Of course there are also third party add-in programs that usually require purchasing a license after a trial period. You can add a bit of security by making sure add-ins are digitally signed. This is done through the Trust Center. Go to the Office Button Options Trust Center Trust Center Settings and finally Add-Ins. Here you can add or change settings to your preference. You can even disable them all together.